The Daily Mail devotes its front page to terminally ill baby Charlie Gard, saying that his parents “bitterly condemned” doctors after making the “heartbreaking decision to let their baby son die”. “Connie Yates reduced a courtroom to tears while accusing Great Ormond Street of wasting so much time her little boy no longer had hope,” says the Mail. 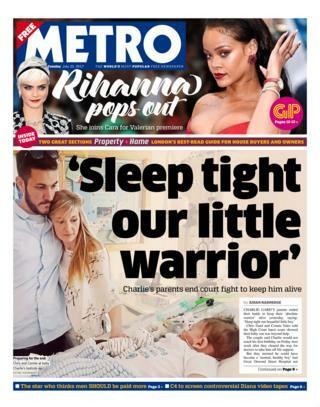 It carries a picture of Charlie before he fell ill.
“Sleep tight our little warrior,” is the headline in Metro. Chris Gard and Connie Yates told the High Court latest scans showed their baby son was beyond help, it says. 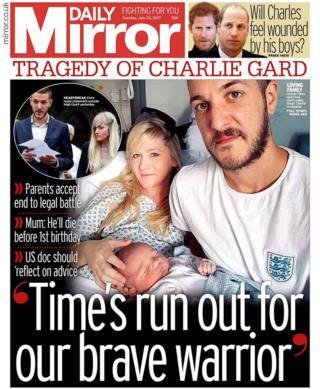 “Time’s run out for our brave warrior,” is how the Daily Mirror headlines the story. “The distraught couple’s tears were tinged with anger as they insisted delays caused by the case meant time had run out to have any chance of the therapy working,” says the Mirror. Charlie Gard’s parents decide to end their legal fight and “let our beautiful baby go”, says the i. Medics and family spoke of their agony over the court battle over the baby’s fate, it adds. 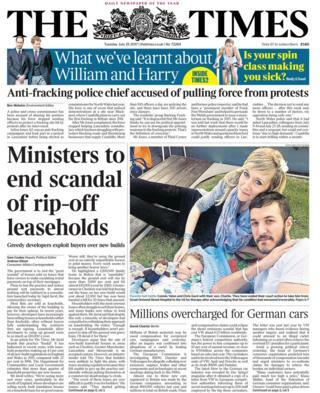 The Times says the government will end the “great scandal” of houses sold on leases that force owners to make escalating rental payments on top of their mortgages. Communities Secretary Sajid Javid will launch a consultation that will outline plans to ban the practice and reduce ground rent payments to almost nothing, it continues. 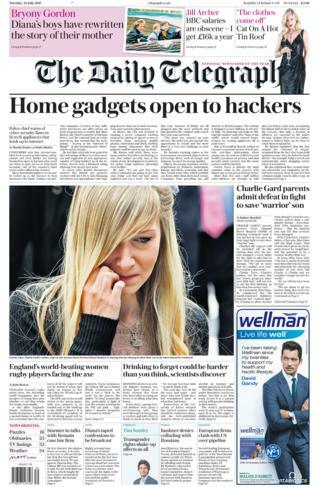 The Daily Telegraph reports that one of the country’s most senior police officers, Durham Police Chief Constable Mike Barton, has warned that consumers who buy internet-enabled devices such as televisions, refrigerators and even kettles are leaving themselves open to hackers who could use them to gain access to their bank accounts. The Guardian says the Bank of England has told banks, credit card companies and car loan providers that they risk fresh action against reckless lending and warned of a looming “spiral of complacency” about consumer debt. “Threadneedle Street admitted it was alarmed about the increase in the amount of money being borrowed on easy terms over the past year,” states the Guardian. 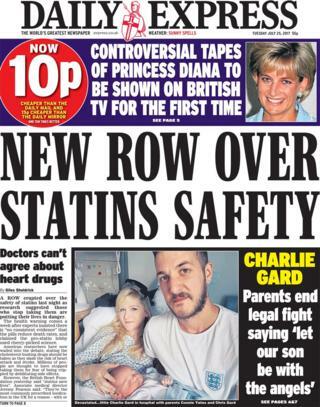 Meanwhile, the Daily Express says a row has erupted over the safety of statins as research suggested those who stop taking them are putting their lives in danger. It comes after an earlier warning that there was “no consistent evidence” the “cholesterol-busting drugs” reduced death rates. The Daily Star reports that the body of Moors Murderer Ian Brady has still not been buried two months after his death because “undertakers refused to touch him”. 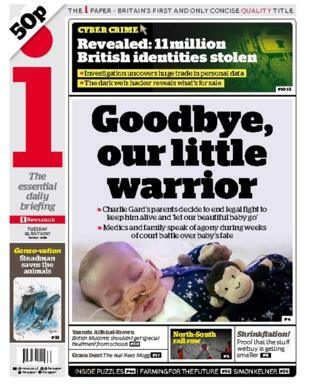 For many papers, the main story is the tragic decision of the parents of Charlie Gard to end his life support. 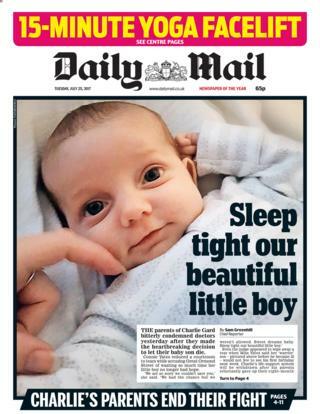 “Sleep tight our beautiful little boy,” says the Daily Mail. 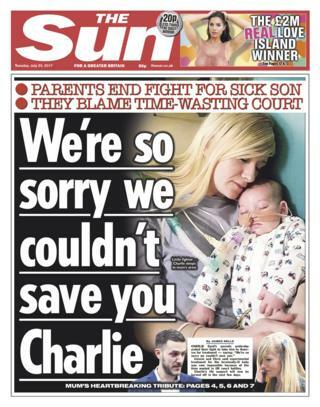 “We’re so sorry we couldn’t save you,” is the headline in the Sun. “Time’s run out for our brave warrior,” is the take of the Daily Mirror. The papers are full of praise for the bravery of Chris Gard and Connie Yates. The Sun believes they “fought with limitless love and awe-inspiring determination”. The Mirror says they acted with “great dignity”. For the Daily Telegraph, their acceptance “that the time has come to let Charlie go” is a “courageous and heartbreaking decision. It is the right one”. The Mail says the question now is whether 11-month-old Charlie will be allowed to go home to die, an issue which has yet to be settled. It says the High Court judge could be asked to make another ruling on that matter if talks between the parents and Great Ormond Street Hospital fail to resolve it. 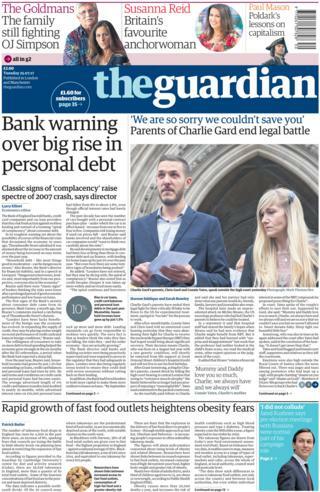 The Guardian leads with the Bank of England’s warning about rising levels of personal debt – and its threat of “fresh action against reckless lending”. The paper points out that the intervention comes a fortnight before the 10th anniversary of the beginnings of the financial crisis – and describes it as a “ratcheting up of Threadneedle Street’s rhetoric” about the possibility of a repeat of the crash that devastated the economy in 2007. A special report in the i newspaper suggests the identities of 11 million British people are being traded on the dark web. Vast amounts of confidential data – including online passwords – are being offered for sale to criminals. It says particular areas are being targeted, with Cardiff, Leicester and Nottingham featuring prominently. The fraudsters then take months to build a full profile of each victim, with the aim of obtaining their banking details. The Daily Star reports that Ian Brady’s body is still laying in a mortuary, two months after the Moors Murderer’s death. The paper says the bodies of Brady and the Manchester bomber Salman Abedi have been “abandoned” in the secret location, because undertakers are unwilling to handle their funeral arrangements. The Police and Crime Commissioner for North Wales is said by the Times to have been accused of abusing his position because his force stopped sending officers to deal with protesters at a fracking site in Lancashire after he complained. Arfon Jones, who formerly campaigned against fracking, said his opposition was only one factor in the decision. North Wales Police insisted it was down to the “high demands” on the force. The Sun reveals how a golf fan helped Jordan Spieth win The Open – when the player’s ball bounced off his head and avoided landing in the long grass at the 13th hole. A fellow spectator tells the paper Spieth shook the man’s hand and apologised. It says the sportsman admitted later that he “felt like he’d got away with murder”.